Over the past week, the Loita herds of mainly zebras have now spread out over the recently burnt area in the south Mara triangle. Some herds are still around Musiara Gate, Olorukoti plain and on the Koiyaki - Olare-Orok Conservancy areas. The migration this year has been gradual unlike in the past. The herds coming from the Loita plains will keep entertaining us before the imminent arrival of the main Serengeti herds from the south. 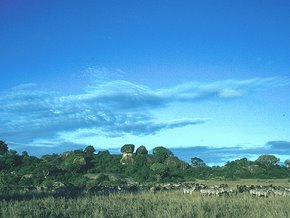 The Mara River has been active, with some zebras crossing onto the Mara triangle. The crocodiles are still enjoying a feeding frenzy, creating huge photo opportunities on what are normally deep waters. The less-than-normal rainfalls have left the water levels on the rivers lower than at this time of they year, and crocodiles are easy to spot as they drag their unfortunate prey into the deeper waters. One of the most spectacular sightings of the past week was that of six nomadic male lions on Paradise Plain near the migration crossing point. It has been many years since such a coalition of males was seen together. Nomadic males will only come together to consolidate their strength, to ward-off competition for food and to increase their chances of taking over a new pride and territory - whose dominating males will not let go easily. There was an improved sighting of leopards over the week, with a sighting every day. Bella who has been our main star over the last few years, and Olive, who we have been covering lately, were spotted along the Talek and Olare-Orok Rivers. There is a new leopard along Ntiakitiak River with two small cubs. She was seen for a few days at the same place near the Double Crossing point with a kill up in a tree, while another young female was seen at Paradise Plains with a kill near the main crossing. Wildebeest migration Safaris, Maasai Mara migration safari, Annual Wildebeest Migration, Masai Mara Wildebeest Migration, Masai Mara Wildebeest Migration, Kenya; Wildebeest Migration, Masai Mara Game Reserve - Masai Mara Map, detailed Map of Wildebeest Migration: For the Wildebeest migration Safaris, check with Adventure Africa Holidays for the best deals and affordable safari packages. Kenya is one of the world's premier safari destinations, which is not surprising, for it can boast such a great variety and concentration of wildlife. A visit to Kenya is incomplete without a Kenya Safari. For the African holiday traveler we offer a full range of options including luxury safaris, custom safari, Kenya wildlife tour, budget camping safari, beach holidays, walking safaris, Mountain climbing in Kenya and Tanzania, family holiday safaris Tours, Nairobi hotel bookings and airport transfers, Zanzibar beach vacations, Africa overland safaris, Mombasa excursions, land safari, bird watching tours, group holidays, family package holidays, Africa adventure trips tour and Uganda Gorilla tracking safaris, Tanzania holiday vacation packages covering Ngorongoro, Serengeti animal migration, Lake Manyara Trips tour, East African Safari Holiday, Kenya wildlife migration Tarangire and Ruaha National park. Group incentive safari travel, seminars and conferencing in Kenya We meet the diverse demands of travelers from all over the world; so... give us an opportunity to organize your dream holiday. For those looking for adventure kenya trips, there are a variety of cheap and affordable discounted African wildlife tours to Kenya and Tanzania, Annual wildebeest migration safaris to Maasai Mara Kenya, Masai Mara game drive safaris, Samburu wildlife photographing tours,Amboseli Wildlife lodge tours Kenya, Africa road safaris to Mombasa via Tsavo East and West National park. African Honeymoon vacation and beach holidays. Tanzania holiday safaris Covering Serengeti Migration tours, Lake Manyara wildlife lodge safaris, Ngorongoro crater wildlife migration safaris, Beach Holiday vacations in Zanzibar, Pemba and Dar-es- salaam. Rwanda Gorilla safaris and Uganda Africa Mountain Gorilla safaris in Bwindi and Mgahinga. We also have Kenya and Tanzania combined wildlife lodge and budget camping packages. Kenya is notable for its' geographical variety. The low-lying, fertile coastal region, fringed with coral reefs and islands, is back by a gradually rising coastal plain, a dry region covered with savanna and thornbush. At an altitude of about 1,524 m and 300 miles inland, the plain gives way in the southwest to a high plateau, rising in parts to 3,048 m, in which about 85% of the population and the majority of economic enterprise are concentrated. The northern section of Kenya, forming three-fifths of the whole territory, is arid and of semidesert character, as is the bulk of the southeastern quarter. In the high plateau area, known as the Kenya Highlands, lie Mt. Kenya (5,200 m), Mt Elgon (4,322m) and the Aberdare Ranger (rising to over 3,963 m). The plateau is bisected from north to south by the Rift Valley, part of the great geological fracture that can be traced from Syria through the Red Sea and East Africa to Mozambique. In the north of Kenya, the valley is broad and shallow, embracing Lake Turkana (160 miles long), while further south it narrows and deepens and is walled by escarpments 610 to 930 mtr high. West of the Rift Valley, the plateau descends to the plains that border Lake Victoria. The principal rivers are the Tana and the Athi, flowing southeast to the Indian Ocean, the Ewaso Ngiro flowing northeast to the swamps of the Lorian Plain, and the Nzoia, Yala and Gori, which drain eastward into Lake Victoria. Low plains rise to central highlands, divided by the Great African Rift Valley. The African continent has something for everyone: from the most hard bitten adventurer to the most discerning connoisseur of food and wine. It is inherently a wild and adventurous area that has only been partly tamed by man, its sophistication apparent in its fashionable cities and charming towns, its primitive origins still evident in its rugged peaks and sprawling savannah and desert lands. Travel to Africa for extraordinary encounters with its exceptional wildlife on a safari not to be forgotten any time soon. Alternatively, travel to Africa to get away from it all and enjoy spectacular, uncrowded powder–white sand beaches. Or, why not spice the journey with some culture? Discover one of the world’s last unique and unspoiled continents. The idyllic islands adrift in the Indian Ocean, on the other hand, are just waiting for the chance to seduce elegant travellers with their warm waters, colourful spice markets and a unique style of barefoot luxury… In general, the style of the Indian Ocean is that of relaxed simplicity with several, truly stylish hotels built from nothing but palm, wood and thatch. Where shoes can be forgotten and computers are a myth. Kenya has a wide range of forests, from coastal forest, through central high montane forests to the thick wet rainforests of the West. These forests support more than just a diverse range of tree and plant species, they are also the territory of a wide range of wildlife, from rare chameleons to Elephant herds, elusive Leopards to colourful Butterflies, Monkey families and prolific birdlife. Most visitors to Kenya want to experience the country’s world famous wildlife. But there are many different ways to experience the Kenyan wilderness. Whether you want to drive by a pride of lions in a four wheel drive, walk through herds of plains game, watch a herd of elephants from the comfortable veranda of a safari lodge, track game on horseback or search for rare birds in a thick rainforest, the possibilities are endless. Kenya’s wilderness areas are famous world wide. The name Kenya has become synonymous with the great wilds of Africa.But they represent far more than you would ever expect, protecting and showcasing a broad range of habitats and species. They are complex ecologies that depend on the conservation of diverse natural resources and systems. The Parks, Sanctuaries and Conservation areas co-exist with and depend on the communities that surround them, and work together to protect the future. From the depths of a coral reef to alpine mountains, from one of the worlds most endangered owls to a herd of wildebeest more than a million strong, the wilderness of Kenya is a wonder to behold..
Naivasha The wide fresh waters of Lake Naivasha attract a great range of wildlife from the surrounding hills. A boat trip on the lake will let you encounter local fisherman, countless hippos and over 400 species of birds ...Elmenteita Walk along the flamingo fringed shores of this beautiful lake and discover a fascinating local history ...Nakuru A living carpet of pink flamingos covers the waters of Nakuru, whose shores are a sanctuary for Rhino, lion and Leopard ...Bogoria This volcanic soda Lake is surrounded by boiling geothermal pools and steam jets, while its freshwater springs draw flamingos and plains game in great numbers …Baringo Freshwater Lake Baringo, the traditional fishing ground of the Njemps tribe, is alive with hippos, crocodiles and a wealth of birdlife …Turkana A vast inland sea, whose Jade waters are home to the worlds largest population of crocodiles, and whose remote shores have revealed an invaluable wealth of prehistoric fossils …Magadi The sun baked salt flats and volcanic springs of Magadi create a unique otherworldly atmosphere ...Victoria The source of the Nile is also the source of an abundance of Nile Perch, a greatly prized freshwater game fish. The North of Kenya is a vast trackless expanse of desert and semi desert wilderness. This hot, sparsely populated land is a place of harsh and stunning beauty. Among the stunning cliffs and ranges and thorn scrub of the North, live some of Kenya’s last nomadic tribes. For these people, the desert wilderness is an integral part of their lives, and they cross these lands with camel trains following traditional routes older than any living memory. For many people, this is the real Kenya, where the great empty spaces hold the promise of real adventure ...Maralal and Beyond This frontier town is the gateway to the great Northern wilderness ...Marsabit and Beyond A beautiful oasis of green set high above the desert floor, Marsabit is surrounded by pristine wilderness, and countless elephants. When you are planning your Kenya vacation let a Kenyan travel agent assist you with your Kenya holiday package. Adventure Africa Holidays Kenya offers an online personalized itinerary planning and Kenya vacation reservation service, where you receive a totally customised Kenyan itinerary that meets your specific Kenya holiday requirements. If you are looking for a Kenyan vacation package we can assist you with Kenyan coach tours and guided Kenya adventure tours. We also have a selection of Kenya vacation self-drive itineraries. Our Kenyan Holiday transportation options include a wide selection of Kenyan rental cars. No matter what your Kenya travel requirements, adventureafricaholidays.com Kenya will ensure that you have the best possible vacation here in Kenya. For more information and booking a Kenyan safari, you may liaise with Adventure Africa Holidays, is a specialist Kenya tour operator nad will guide you all along. An African safari is the most exciting adventurous destination for all wanderers. Africa, the land of mystery, has a lot to offer for tourists who come from different parts of the world. However, it is quite useful to take care of certain precautions for maintaining your safety and security while taking the pleasure of Kenya holidays. One of the most important things while visiting a foreign country is to avoid walking to the bushes alone. Always seek guidance of a local person to explore the country on foot. Not to forget, stay away from animals as they can be excited by any of your act and cause a dangerous act. Therefore, it is advised to maintain some distance while feeding the animals. A traveler must ensure a good quality medical insurance before visiting any African safari. Holiday insurance also includes coverage for baggage loss, third party liability, cancellation and curtailment, etc. In Kenya, travelers' cheques and major credit cards are readily accepted. A traveler is suggested to carry a small amount of cash otherwise he or she can be a target for thieves. One should always change currency through the authorized dealers and banks. One should keep a track of his or her passport number, airline tickets and travelers' cheques while visiting any African country. Make sure, you keep these original documents in a safe place, separately from the usual luggage bag. African countries are prone to various kinds of diseases and infections. That is why, it is better to go through a thorough medical check-up of your body. Consult a good doctor and take adequate antibiotics. You can keep good quality of mosquito repellent to avoid mosquito bites. Try to use mineral or bottled water while on a trip to Africa. In hard & soft drinks, you can get a wide range of local beers, as well as imported wines, beers. Choose your drink carefully to remain healthy. Kenya holidays can be a blessing for any wildlife lover and explorer. However, a bit of precaution can enhance your happiness further. Kenya Safari, Africa Safari, Safari In Kenya: online safari booking, Kenya Holidays, Africa safari, safari in Kenya. For all the advice on African safaris to Kenya, Tanzania and Zanzibar, consult a professional Kenya safari tour operator, Adventure Africa Holidays. An African Safari vacation or Kenya Safari holiday is a popular travel goal. It brings together travel to an exotic location, seeing unique wildlife, an adventure with just a hint of risk, great photography opportunities and memories to last a lifetime. Just mention you are going on an African Safari and your friends are sure to be envious and impressed. In Kenya you can mix the idyllic experience of a tropical beach vacation on the warm Indian Ocean with an East African wild animal safari expedition. Combining the two makes for a unique holiday. Part of your vacation is filled with excitement as you observe African wildlife at close quarters, while part is spent relaxing and soaking up the sun on a sandy beach. Kenya is an exotic vacation destination offering a complete break from western city life routines with its opportunity to combine beach and African safari vacations in one trip. For couples planning a wedding, Kenya is well worth considering for a very special honeymoon experience. A vacation in Kenya has become a popular choice for European travellers in recent years, especially among the British. This has been helped along by the relative strength of European currencies. Kenya as a destination is less well known among Americans because of the greater travel distance, but is gaining in popularity as Kenya's reputation spreads as an opportunity for a unique vacation experience. Kenya enjoys a near perfect year-round climate for vacationers. There is an annual rainy season between May and July each year, but the rains come in short tropical bursts that should not detract from the enjoyment of your Kenya holiday. There is a lot to do in Kenya. By combining an exciting African safari adventure with a relaxing and secure tropical beach resort vacation, visitors can experience a unique holiday that is distinctive to Kenya. Most of the Kenyan beach resorts and hotels are located about an hour's drive from Mombasa Airport. They offer sandy beaches and swimming in the warm Indian Ocean. There is a choice of accommodation for all pockets, from budget hotels to top level luxury five star resorts. There are a wide variety of safari options to choose from. A night or two away on safari in the Tsavo National Parks may meet all your wildlife viewing expectations without having to travel very far from your beach resort. This can be just a simple safari adventure, or you can choose various added features and luxuries. Traveling further to Nairobi, you can experience your safari in the Masai Mara Game Reserve. Luxury facilities and safari themed accommodation in a 4-5 night expedition will more than complement a luxury beach resort vacation on the coast. You can choose other options as you wish. The Masai Mara Reserve may offer more animal variety than the Tsave Parks, but the wildlife is abundant in both locations, to ensure your safari experience is thrilling and filled with excitement. Expert safari guides ensure you can safely view the wild animals close at hand in their natural habitat. Whatever safari options you choose are sure to be satisfying. Without question, the memoirs and the movie “Out of Africa” have inspired many to dream of Kenya vacations, but even if you haven’t read the book or seen the movie, Kenya is calling. Kenya travel is an amazing thing. Few countries can even dream about matching the Kenyan experience, and should you be fortunate enough to enjoy a holiday in Kenya, you will likely be the envy of many. At least you should be. Boasting bold landscapes, excellent beaches, world-class safaris, and so much more, Kenya is happy to share its bounty with outsiders. Speaking of sharing, you’ll be sharing the Kenyan countryside with some of the most impressive animals on the planet during Kenya trips, and viewing them in the wild is about as ideal as a travel pursuit could ever be. On your trip to Kenya Africa, it is imperative that you book at least a one-day safari. If you have the time, a multi-day safari is always a welcome endeavor, and with so many great safari parks to choose from in Kenya, you’ll surely find one that’s right for your vacation. The top Kenyan game reserve is the Masai Mara, though by no means should you shirk the others, though if you should get the chance to see the wildebeest migration at the Masai Mara reserve, by all means jump on it! Seeing the flamingos at Lake Nakuru National Park is absolutely unforgettable, and hitting the Nairobi National Park just outside of the Nairobi city limits is an utter joy. Speaking of Nairobi, it just happens to be one of the nicest cities found anywhere on the African continent. Modern, thriving, and well laid out, Nairobi is a joy to explore, especially if you are up for an interesting dining affair. Nairobi has the best restaurants in Kenya, and meat eaters will not want to miss the chance to visit Kenya’s most famous restaurant, Carnivore. Here, meats of all kinds are speared and roasted over a fire pit, which is a native Maasai practice. The Maasai of Kenya, who are most recognizable for their red robes and tall stature, are just one of the ethnic groups that help to make Kenya vacations so fascinating. Closer to the Kenyan coast, the Swahili people are just one more cultural treasure, and even though English is an official language in Kenya, you will hear a range of interesting tongues on Kenya trips, that’s for sure. Kenya’s eastern border runs along the Indian Ocean, and the beaches here are nothing short of spectacular. Plenty of alluring Kenyan beach resorts can be found up and down the coast, and since they are really quite affordable, you might entertain the idea of spending at least a few days at one during your holiday in Kenya. If you really want to maximize your time during your trip to Kenya Africa, you can book a vacation package that includes an array of Kenyan experiences. There certainly are a variety of intriguing things to do in Kenya, and the chance to mix and match landscapes and activities is always there. Perhaps you’ll be interested in taking a safari, climbing Mount Kenya, and spending some time at a beach near Mombasa. The Kenya vacation packages include experiences like these, often jumbling them together in a “Best of Kenya” kind of fashion. Since Kenya vacation packages often include your transportation, meals, accommodations, and activities, they are extremely convenient and attractive. A holiday in Kenya will live on forever in your memory, and you’ll likely find yourself dreaming of the day when you can return once you get back home. Kenyans are extremely friendly people on a whole, and though civil unrest is always an underlying concern, tourism here seems to always remain a pretty safe endeavor. Besides occasional crime, the fact that lions, leopards, and other intimidating creatures might be lurking outside your lodge room or tent has led most of the nicer Kenyan lodging establishments to hire competent security staffs so that you can worry less and enjoy more. The Kenya lodging choices are quite excellent, really, and if you can swing a stay in a safari lodge and/or a beach resort, you’ll be enjoying the best digs that Kenya vacations can offer. These properties range in price and amenities, so there are choices to fit a range of budgets and tastes. On Kenya vacations you can have it your way. The chances to book tours and activities are many, the food is good and plentiful, the hotel service overridingly excellent, and the skies wide open. You can dream big in Kenya, and nobody will stop you from making your dreams a reality here. Consider the various safaris offered in Kenya to include Masai Mara Safari, Kenya safari travel guide, Masai Mara, east africa safaris, Masai Mara safaris, Masai Mara, Kenya | Masai Mara Safari, Masai Mara National Reserve. For all your Kenya safari travel, holidays and packaged trips, Adventure Africa Holidays is your ultimate Kenya safari company choice. Adventure Africa Holidays is a specialist Kenya tour operator for Kenya luxury lodge safaris, Kenya lodge safaris, exclusive safari holidays, Masai Mara lodge safari, luxury Samburu tour, tour Lake Nakuru, Amboseli lodge trip, Aberdare holiday, Sweetwaters luxury tented camps, mount Kenya safari, Tsavo lodge trips, Tsavo west safaris, Tsavo east lodge safari. More than a quarter million Britons enjoy Kenya holidays every year, and one can say that Great Britain enjoys relative proximity to Kenya, a trait that is surely enviable. Europeans in general have been enjoying holidays in Kenya for some time now, the first European visitors being the Portuguese who landed on the shores of the Kenyan coast more than 500 years ago. Luxury holidays Kenya can surely accommodate, and those looking for a more grass roots experience will find Kenya to be just as welcoming. These days, Kenya package holidays can be quite extensive, covering a diverse range of landscapes and experiences, and Kenya holidays are practically without compare when one considers all of the fun and unique things to do here. The Masai Mara game reserve alone is enough to justify holidays in Kenya, but it’s really only one great tourist attraction in a sea of many. Many Kenya package holidays include the flight and all, so once you find one you like, there’s really not much in the way of planning to worry about. Charter flights to Kenya are in good supply across the European continent, and many times, you can find good discounts with the charter companies. As a rule of thumb, charter airlines will almost always prefer to sell a vacant seat at a discount rather than have it go empty. Regardless of when you choose visit Kenya, you can be sure that the trip will be a most memorable one. There are plenty of great beaches in Europe, especially in warmer lands like Spain and Greece, but come winter, the weather is not conducive to the beach experience that most people covet. The Kenyan beaches are always warm, specifically during the winter months, so escaping to Kenya come February is a good way to remedy the winter doldrums. Besides the Kenya beaches, the Kenya safaris are what bring in the bulk of tourists. Places like the Masai Mara game reserve and the Kakamega National Forest are among the world’s best places to view wildlife, and the chance to see the “Big Five”in the wild is something most folks won’t find anywhere near home. The Kenya safari lodges and beach resorts are certainly a big reason why holidays in Kenya are so rewarding. Near the Masai Mara and other inland attractions like Lake Nakuru, there are excellent lodges that provide enviable accommodations and savory meal choices. On the coast, the resorts not only provide great rooms, but they are also high on activities, like snorkeling, deep sea fishing, and boating. The best Kenya package holidays will include a visit to one of the Kenya safari parks and at least a few days on the coast. Unless you prefer to camp, many packages arrange for their guests to stay in various lodges and resorts, and many of these lodging establishments can be all inclusive, meaning your meals are also covered in the overall price. Speaking of meals, the Kenya resorts and safari lodges are known for their quality cuisine. Top chefs blend local flavors with international ones, and especially on the coast, seafood is abundant. Meat eaters will love Kenya holidays, especially for the Nyama Choma, or roasted meat dishes, which can sometimes feature game species like zebra, crocodile, and warthog. The best restaurants in Kenya are found in Nairobi and Mombasa, but more and more quality eateries are popping up in popular Kenyan vacation destinations. The Swahili people are among the more interesting native groups in Kenya, with the inland Kikuyu and Luo people figuring prominently, so everywhere you go in Kenya, culture abounds. While you are enjoying holidays in Kenya along the coast, cultural points of interest like the Gedi Ruins and the Takwa Ruins can add considerable depth and understanding to your Kenya holiday experience. Museums in towns like Mombasa and Melindi provide great insight into the coastal history of Kenya. After hitting the Kenya beaches and safari parks, those booking Kenya holiday packages might also want to include a mountain-climbing expedition. Mount Kenya, which is found in the highlands of western Kenya is a pretty difficult climb, but the views from atop it are worth the effort to summit. Not far across the border in Tanzania, Mount Kilimanjaro is relatively easy to summit, requiring little more than proper clothing. Being the continent’s tallest peak, Kilimanjaro certainly finds its way into many a Kenya holiday package. The kinds of experiences that one can enjoy on Kenya holidays are practically without compare. Kenyans are happy to share their part of the world with any and everyone, which is great news to travelers who are looking for a most complete holiday experience. Whatever your travel needs, Adventure Africa Holidays and travel will offer you personalized and professional services. We would be happy to offer you Lamu hotel bookings, Tanzania Zanzibar Beach holidays, wildlife budget camping or lodge safaris to Maasai Mara, Samburu, Tsavo Wildlife Safari, L. Nakuru National park, Kenya/Tanzania and Uganda online safari booking, Luxury safaris, group adventure wildlife safaris and much more. An African Safari vacation is a popular travel goal. It brings together travel to an exotic location, seeing unique wildlife, an adventure with just a hint of risk, great photography opportunities and memories to last a lifetime. Just mention you are going on an African Safari and your friends are sure to be envious and impressed. The Masai Mara Reserve may offer more animal variety than the Tsavo Parks, but the wildlife is abundant in both locations, to ensure your safari experience is thrilling and filled with excitement. Expert safari guides ensure you can safely view the wild animals close at hand in their natural habitat. Whatever safari options you choose are sure to be satisfying. A Kenyan tropical beach and African safari vacation is an exciting combination to choose for your next vacation, with affordability options available from budget to luxury.